Last month, Synthetic Turf International made the trek down to sunny Orlando, Florida for the 2019 PGA Merchandise Show. STI showcased many of their golf turf products to golf professionals and influencers in a variety of booths, both across the show floor and the Demo Day. STI featured their NP 50 putting products in their booth, along with both EZTee options (EZtee Poly and EZtee Hybrid). Visitors were able to putt on the green inside the STI booth and talk with distributors from across North America about the benefits of a tee line or indoor golf practice facility. Over the three days of the show, STI met with hundreds of people interested in Experiencing A Greener World…and a better golf game. On Monday before the Demo Day, STI was fortunate enough to build a putting green for Callaway Golf at the Orange County National Golf Resort on their driving range. The range is, essentially, a big circle 400 yards in diameter. Golf equipment manufacturers set up booths around the entire range for Demo Day. Callaway used the portable putting green for one day at Demo Day. It was installed over Tour Links panels and cut onsite. The NP50 green featured a SoftLawn Pro Cut fringe and second cut of SoftLawn Kentucky Blue Plus. Callaway showcased their new Odyssey putters. Ping’s putting green at Demo Day at the 2019 PGA Merchandise Show.STI also built a mini putting green for Ping inside their Demo Day booth. The green was 12′ X 16′ of NP 50 over Tour Links panels. The panels are convenient for portable putting greens. The Ping putting green saw plenty of action during Demo Day as well. Visitors were able to watch a demonstration by World Long Drive Tour Pro Troy Mullins, who drove one about 290 yards into a stiff 25 MPH wind. 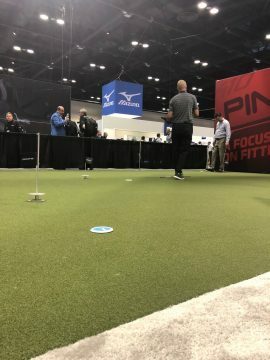 Putting green inside the Ping booth at the 2019 PGA Merchandise Show.STI provided putting turf to the Ping booth on the show floor, as well. The NP 45 was used under all of the simulators and also as a putting green inside their booth. Callaway Golf’s booth putting green has taken on many shapes and sizes over the years. Aside from their Tank design in 2014, this was the most ambitious design yet. The green was built over Tour Links panels with NP 50 for the putting surface and SoftLawn Pro Cut for the fringe. For the fourth year in a row, STI was the choice of The Golf Channel to install their putting green inside the studio at the show. The Morning Drive filmed several segments on the putting green during the show. Visit our application page for more information, browse our gallery for ideas and contact Synthetic Turf International to Experience A Greener World and a better golf game.